Fairlands Valley Spartans were joint hosts for the third cross country league race at Willian and provided many marshals and other helpers but the club still had seventeen women and 21 men finish the race. Perhaps the most amazing performance came from YUKO GORDON, 65 plus age group or not, she led in the women’s team in 36 minutes 33 seconds for the undulating five miles or so beating many of the male and female seniors. GRANT RAMSAY was first in for the Spartans, eighth overall in 27 minutes 57 seconds. CHRIS WESTCOTT, 12th in 28:17; SIMON JACKSON, 14th in 28:52 and JON PENNELL 26th in 29:24 were also under thirty minutes. The five strong women’s “A” team was completed by MICHELLE REEVES 247th in 38:49; NATALIE LAWRENCE 248th in 38:51; ISABEL GREEN 256th 38:55 and JULIE SIMMONS, 299th in 41:29. Great participation by FVS meant the club finished three complete women’s teams. Male teams consisted of eight runners. The others in the Spartan men’s “A” team were all in the top 100 DAN HUKIN 67th in 31:16; RICHARD SPRINGALL 78th in 31:40; TODD GRAY 92nd in 33:16 and MIKE GREEN 93rd in 33:22. The Fairlands female “B” team was led in by TRACY PEZ 42:11 with SOPHIE COWAN 42:54; JENNY GARRETT 42:55; KAREN PALMER 43:18 and KELLY McHALE 44:59. PENNY SCHENKEL was first in for the “Cs” with 47:37. 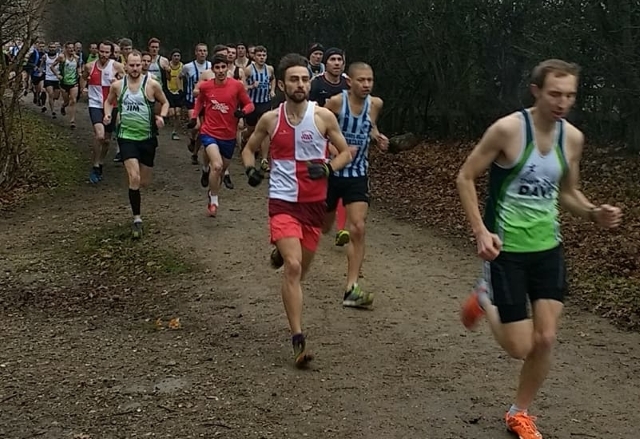 The next cross country league race will be in Watford on Sunday 14th January. ERICA GRAYSON has had an amazingly year since joining Fairlands Valley Spartans and on Sunday ran a 10K time she would not have thought possible. She enjoyed a fantastic fast run past the beautiful Grafham Water Reservoir and on into the village of Ellington and back. Only 300 runners but Erica ran a superb new personal best of 51 minutes 34 seconds. CHRISTOPHER JOHANSEN finished in 1:17:30. Keeping with the waterside theme CAROL PAUL ran the Portsmouth Coastal Waterside Marathon which was cold and frosty to start with and finished with rain. On a trail out and back course Carol completed the marathon in 4 hours 56 minutes 54 seconds. The weekend before last many Spartans were looking forward to getting a five mile time on the list with the Festive Five at Welwyn Garden City but it was cancelled due to heavy snowfall. However with the rest of Fairlands Valley Spartans in the cold CAROL PAUL ran the Lanzarote marathon on Sunday in 4 hours 37 minutes 21 seconds in hot conditions with the occasional breeze. With the local Stevenage parkrun cancelled as a result of residual ice following last weekend’s snow fall, and the third race of the Cross Country League season scheduled for the following day, there were fewer Spartans than usual in parkrun action. Four Spartans headed over to Panshanger with THOMAS SAUKA first Spartan to finish in 21:50 for 26th place. CHRIS HOLLAND and TIM ROBINSON finished in 28:13 and 31:35 respectively, while TRACY STILES clocked 32:24. In other relatively local runs, DAVE SMITH finished in 25:03 in Cambridge, MICHAEL O’KEEFE was at the Wimpole Estate with 30:27 and JAMES SOUTH went to Westmill and crossed the line in 31:55. Finally DARYL STEVENS was a little further north than usual, running at Richmond in a time of 46:09. At Stevenage parkrun RICHARD SPRINGALL was third finisher in 19:09 on a bitterly cold morning in Fairland Valley Park. TIM SABAN was the next Spartan finisher in 21:11, a new course PB. There was also a new Stevenage best for ELLA GOWER, finishing in 32:46. Despite the cold there were twenty three Fairlands Valley Spartans at the Stevenage Parkrun. The others included VERITY FISHER volunteer tail runner in a chilly 55 minutes 23 seconds, TRACY PEZ in 26:57 and VICTORIA BRETT in27:07. Elsewhere NATALIE LAWRENCE was first woman (and 13th finisher overall) at Bognor Regis, crossing the line in 22:35, while HANNAH NEALE was second woman at Southwick in 22 minutes exactly. With three weeks to go 234 different Spartans have at least one event completed in the short championships and 153 in the long championships. CRAIG HALSEY leads the men’s open short distance championship with 78.6% and is pursued by SIMON JACKSON on 76.8% and GRANT RAMSAY on 75.3%. However ANDREW PATTERSON is on 76.2% with just once race to complete. The short distance championship is calculated on the best runs in the year from three out of 1500 metres, five kilometres, five miles and 10 kilometres. SUZY HAWKINS leads both women’s long distance tables. In the open championship she has 68.3% compared with 63.1% for NICOLA KENNEDY; 61.4% for ISABEL GREEN; 57.2% for HAZEL SMITH just ahead of KERSTIN WEINER on 57.1%. The long distance championship consists of the three distances of 10 miles, half marathon, 20 miles and marathon. Suzy also leads the age related championship. Her score is 70.9%. Just 0.04% separates CAROL PAUL second on 66.34% and NICOLA KENNEDY on 66.30%. JAN FRY, fourth, on 63.9% is just ahead of CATHY CRAIG on 63.8%. So far nineteen women have completed a full qualifying series in the long distance championships. There’s still for others to qualify. ALISON WOOD leads the women’s short distance championship with 73.3%, ahead of SUZY HAWKINS on 69.3% and ISABEL GREEN on 65.7% but there are several others “bubbling under” with just one run to complete including RUTH REILLY on 67.1%; NICOLA KENNEDY on 65.7%; HANNAH NEALE on 65.6%; CLAIRE HADDLETON on 65.3% and MADDIE PRITCHARD on 65.2%. There are long and short distance championships for men and women, open and age related. The presentations will be made at Fairlands Valley Spartans’ Annual Dinner, Presentation Evening and Dance on Friday 23rd February. Christmas Social Run from Marriotts Sports Centre (SG2 8UT) at 7p.m. on Thursday 21st December.